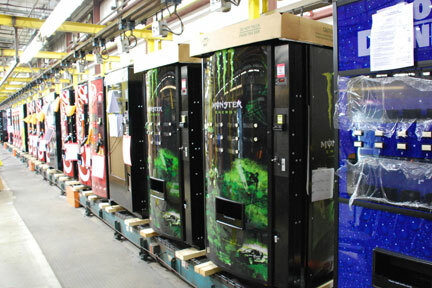 Vending Machines, Visual Coolers and Energy Star Vending Products — Royal Vendors, Inc.
Our vending machine designs are the result of building more than one million vendors for the soft drink industry for 25 years. The Merlin IV line provides distributors, vending operators and bottlers with many features, including superior soft drink package flexibility, Energy Star Tier 3 compliance, a vandal-resistant cabinet, and electronic refrigeration controls. The newly-redesigned Glass Front Vendor provides all these features, plus extremely high merchandising visibility for up to 40 vended selections. All Royal Vendors for United States customers are ADA compliant and all Royal equipment carries the appropriate safety and rating agency certifications. We supply a variety of trademark-identified and generic-identified vendors to meet virtually any customer requirement. Royal’s Visual Cooler is built to give you superior performance for years, even when placed at the toughest locations. Featuring the industry’s strongest cabinet, our RVC line has been selected by discriminating users. Additional models include the Health Timer Cooler, designed for the new micro-market segment, with an integral safety locking mechanism to meet National Sanitary Foundation [NSF] Standard 7 for potentially hazardous foods. Royal Vendors was the first cooler manufacturer in the United States to receive NSF approval for this type of cooler. The Royal Health Timer Cooler is the model of choice for the leading micro-market companies.